I love digging into the world of digital archives. It's like archaeology for those of us who don't want to leave our seats. Today's discovery turned up in the endlessly fascinating collections of Hathitrust (www.babel.hatitrust.org), a digital collaboration of various research libraries. Tucked deep in the virtual stacks was an 1874 issue of Frank Leslie's ladies magazine, a nicely illustrated periodical of fashion and fiction that also carried a variety of non-fiction reports from around the world. 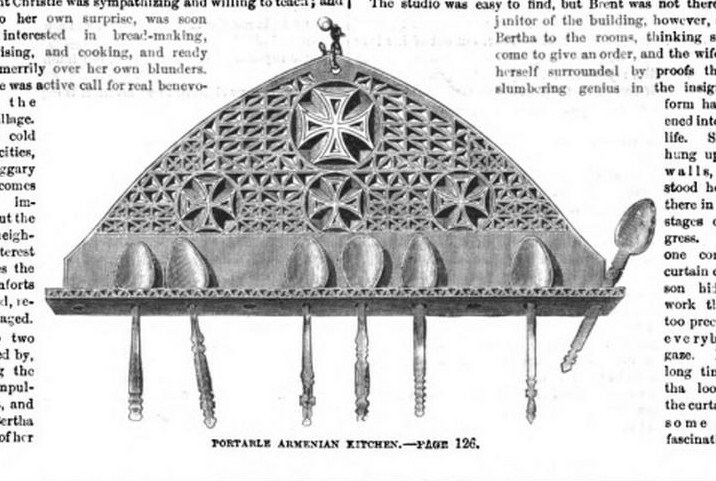 There, among the bustles and whale-bone corsets, was the photo at top over the caption, "Portable Armenian Kitchen." The companion item explained: "In nearly every Armenian house will be found, hanging against the wall of the principal room, one of these contrivances for holding the kitchen utensils. It is nothing more than an ornamental rack, carved out of wood, in which the spoons used at meals are placed. A great deal of taste is shown in the matter of curious devices for these portable kitchens, which show at a glance, perhaps as much as anything else, the social status of the family." There's nothing more, but it looks pretty neat to us (even though we'd call it a spoon rack rather than a kitchen.) And it's clearly Armenian, judging by the cross. Sadly, nothing like it made the journey to America with either of our families. Have any of you ever seen anything like it?